"Do You Ever Have A Question About Training Or Behavior?" "The Answers Are Just An E-Mail or Phone Call Away!" Because we are always here to guide you with solutions to everyday situations. After all, we are not just a "Pet Fence Company" ... We are "Pet Professionals"
Pet Fences are not always the answer for day to day problem solving. 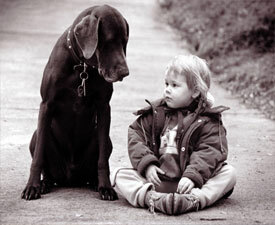 This is where our know-how and your relationship with Contain-A-Pet will pay dividends to you and your pet. We have master dog trainers on staff who have extensive experience in every form of training and behavior modification. This experience dates back to the 1980's. There isn't much we haven't seen over the years. Just email us with your question and we will work tirelessly to provide the answers you need. For complicated answers we will discuss your situation by phone. And if needed, we can direct you to specialized professionals in your area that can work with you. Read on to find out about training and behavior information in our newsletter format. It will cover everything from a to z. It is all about your pets. I would like to take this opportunity to tell you how happy we have been with our underground fence. It was amazing to me how quickly all the dogs adapted to the electronic collars and the dog fence. I'm certain that the ease with which the dogs adapted was largely due to your assistance in starting their training to the system. With our busy schedules, it would have been difficult for us to do the training involved without your patient assistance. In my experience as a veterinarian, animals always respond better to consistent and compassionate discipline. Your entire staff obviously cares deeply for the animals and that is evident in their treatment of the pets that they help train. The benefits to using an underground fence are obvious in that our animals are now protected from straying onto the road. I have also encouraged many of my clients to consider an underground fence to prevent their dogs from roaming the neighborhood. Keeping a pet close to home can also prevent other injuries as well as exposure to poisons, spoiled foods, etc. Again, let me say how completely thrilled we have been with our fence. the service that we have received since our purchase has been outstanding. How Proper Fence Training and Conditioning For Your Pet Can Make Your Life Easier For Years And Years. Your Contain-A-Pet Dealer will work with you when you first start training your dog or cat to your electric pet fence. It is important to follow their guidelines. The training program is custom designed around your dog's personality. Many clients tell us how their dog or cat was trained in one or two days. That is the exception rather than the norm. It is in your pet's short term memory. It is possible that they can forget what they know in this instance. Thus, they can get corrected or even escape the fence. This creates more needless work for you. If you follow the training (only 10-15 minutes per day) your pet will be conditioned for life. The only way that conditioning will change is by reverse conditioning which is nothing more than your dog learning a new set of conditioning principles. Reverse conditioning in relation to underground or electronic fences occurs when your pet approaches the "off limits" area and nothing happens. This can occur when the collar is loose, the battery is drained or the underground radio fence signal traveling through the wire has been cut. Contain-A-Pet and your Dealer have taken many precautions to prevent reverse conditioning from happening. From alarms to warnings to battery plans, we will teach you everything you need to know so that you and your pet's life can continue without missing a beat. Everyday pets brighten our lives. Dogs are their with a tail wag even on our worst days. We ignore them, we berate them ... we do all the things we don't mean to do when things don't go the way we plan. We want to help change that ... starting in 2006. Beginning soon, we are going to start a newsletter that will provide behavior and training suggestions, warm pet stories, freebies, ebooks and anything else we can do to pay our respects to the unsung friends in our lives. This will be a joint venture from all of us associated with Contain-A-Pet and you. We want your contributions. How to walk your dog loosely on a leash. How to and how not to call your pet to you. How to stimulate your dog's brain and reduce boredom. We will expose you to different forms of training with pros and cons of each. Little things to make you the "Leader of the Pack". How to pick your next pet. The major personality groups of dogs and how they effect family life. Toys - the safe ones and the potentially dangerous ones. Sign up for our newsletter today because your pet will be glad you did!